Licensed Collection Agencies have numerous recurring reports and renewal events that must be filed in order to remain compliant. Most Collection Agency Licenses renew annually or biennially. To ensure compliance, licenses must be renewed on time with the appropriate fees. Some renewal applications must be filed 30 or 60 days prior to a license expiration date. In addition to license renewals, some states have an annual financial reporting requirement. The purpose of the annual report is to provide the licensing department with an account of the agency’s activities in the state. Collection agency license renewal and annual reporting requirements vary by state and due dates are spread across the calendar. For example, Alaska Collection Agency licensees have biennial renewals due in June every other year and annual reports due in January. Wisconsin Collection Agency licensees have annual renewals due in June and annual reports due in March. Idaho Collection Agency licensees have annual renewals and require quarterly reports. Collections Agencies also must remain in good standing with the state in which they are licensed, renew all surety bonds in a timely manner, and be sure to update the appropriate government agency of any important changes to the business and its structure, such as address, name, officer or ownership changes. 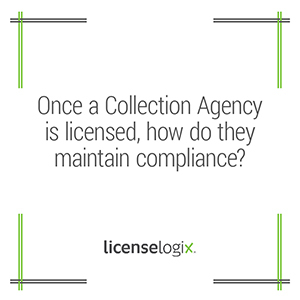 LicenseLogix will help collection agencies obtain all licenses and registrations, minimizing time-consuming and costly delays. We can also manage ongoing compliance by filing all renewals and annual reports. For additional help you can fill in the form on the bottom or give us a call at (800) 292-0909.